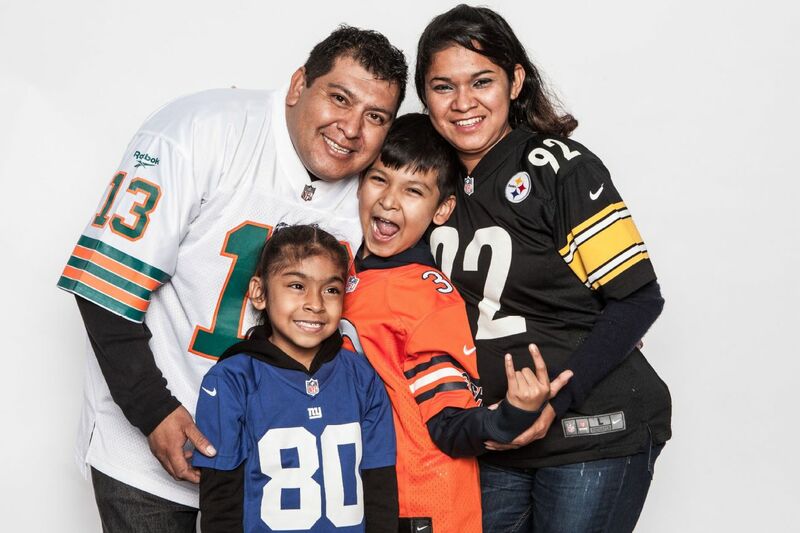 With the NFL returning to Mexico for the first time since 2005, these fans put their passion for the game on display by going all out with their wardrobe at Fan Fest in Mexico City. omething about the city of Boston has always fascinated Erick Colin Mena, a 36-year-old born and raised in Mexico City, so he began following the Patriots. During the NFL Fan Fest over the weekend, he wore a sweatshirt that read: "I might live in Mexico, but my team is in New England." Mario Hernandes, 26, was decked out in a full-on Raiders costume, mask and everything. His mom gifted him a Raiders-themed backpack at age 17, and ever since then he's been hooked. A similar thing happened to Jose Antonio Bohon, a 50-year-old who watched Fran Tarkenton as a kid, believed him to be "ahead of his time" and is now as big of a Vikings fan as you will ever meet. Then there is Josue Alvarez, 22, who first began following the Packers because he really, really likes cheese -- seriously. Alvarez, of course, was wearing a foam cheesehead hat. The Houston Texans and the Oakland Raiders are about to play the first Monday Night Football game outside of the United States at the distinctive Azteca Stadium, a highly anticipated matchup that will be contested in front of a sellout crowd and will prompt millions of others throughout Mexico to watch from home. In the days leading up to it, tens of thousands of fans came through the NFL Fan Fest at Chapultepec Park, displaying their adoration for American football in their outfits. "I am a lifetime fan, and when my son told me that he wanted to play football, we discovered that the closest team to our house was [called] the Raiders, [so] he became a Raiders fan since then. My wife is my makeup artist. I try to go with makeup to all of my son's games so I can cheer him [on]." "I became a fan because one of my favorite uncles, the oldest in my mother's family, he is a Green Bay fan. Because of him I caught the football and Packers fever." "My team is the Steelers. I'm a fan since the '70s, since Franco Harris' time. The big Steel Curtain impressed me. In that time, I had to stay up late at night to watch the games. ... I watched them with my dad and my brothers." "I have been a fan for the last 13 years. I became a Ravens fan because of Michael Oher's movie 'The Blind Side.' Oher is my favorite player. ... I like his strength, his ability and how he stops the rivals." Diego: "Mexico should keep hosting NFL games because here we have a lot of diversity. Mexico and the U.S. have a very tight relationship, and we are great hosts." "I became a fan in a very weird way. When I saw Denver lose [the AFC Championship Game] against the Buffalo Bills, I was moved by seeing them sad. My favorite player is John Elway, of course. I saw him as a very passionate player. He never gave up, and I liked that he was named the Comeback Kid." "My dad has been a fan for 50 years, and he inspired me to become one. Now I'm pregnant, and I hope to do the same with my baby. ... I remember beating the Broncos -- actually that day during the game -- I felt my baby move for the first time." "I admire very much Emmitt Smith. His last run that made him a legend made me fall in love with the Cowboys, but Terrell Owens is my favorite player. His explosive game was amazing." Samuel: "My dad is a Cowboys fan, and the rivalry between his team and the Eagles is a big tradition. I wanted to be part of it, and that's why I decided the Eagles as my team." "I'm a Patriots fan since I've known my boyfriend -- nine months ago." Gabriel: "My dad loved football; he introduced me to the sport. Soon Warren Moon got my attention and made me fall in love with the [Houston Oilers]. My love for the Houston Texans started when the Oilers disappeared." "I'm a fan of Kansas City since I was 5 or 6 years old. My parents transmitted it to me. I watched the games, and I started to like it. I bought this poncho in Cancún. Not [a lot of people have] it; it is very special." "My favorite player is [wide receiver Jarvis] Landry, because 14 is one of my favorite numbers. My dad is a Raiders fan, and my mom is a Seattle Seahawks supporter. I love the NFL because I'm an athlete, and also because it's the first time to see something like this in Mexico." "I am the president of Club 49ers Mexico. ... The NFL must expand in Mexico since there are so many fans -- the supporters and players keep on growing." "I am a fan because of my father. He used to play at Instituto Politécnico Nacional. In my house we used to talk about football, and my brother and I followed with the tradition. Some of my father's family members moved to the U.S., and when we visited them, we decided which was our favorite team. And by this time my family said that I was naughty and some type of bad boy -- that's why I chose the Raiders. A long time ago I had the chance to watch the Raiders at Los Angeles. It was a dream for me. Finally I think that dream is coming back. I have my ticket, and I'm not going to miss this game." Rodrigo: "I started playing football when I was a kid. I liked it because of the toughness of the sport." Monica: "I'm a fan since junior high. I loved watching the games, even the college games, from Mexico." "I designed the Aztec Raider to give a Mexican touch to the Black Hole from the U.S.. I wanted to do something different and to show the love I have for my country, something to create a link between Mexico and Raiders. I made all this by myself." "I became a Dallas fan when I was in primary school. I used to watch the games with my dad, and I was attracted by the uniforms and helmets. My all-time favorite player is Troy Aikman, for the leadership he used to have, the way he handled games. He never gave up; he was very precise. I think the NFL is a big show, and we were missing it." "My love for the Steelers arose to contradict my dad, who is a 49ers fan. We bet a beer or a meal when there's a match between our teams. My wife and I buy dresses of the Steelers for [Alexa]. Her aunt bought her a dress of the Patriots. She will choose her favorite team when she wants. I hope that it will be the same [as] mine and my wife." Gamaliel: "I love their roughness. They never follow the rules. Sometimes I don't follow the rules."